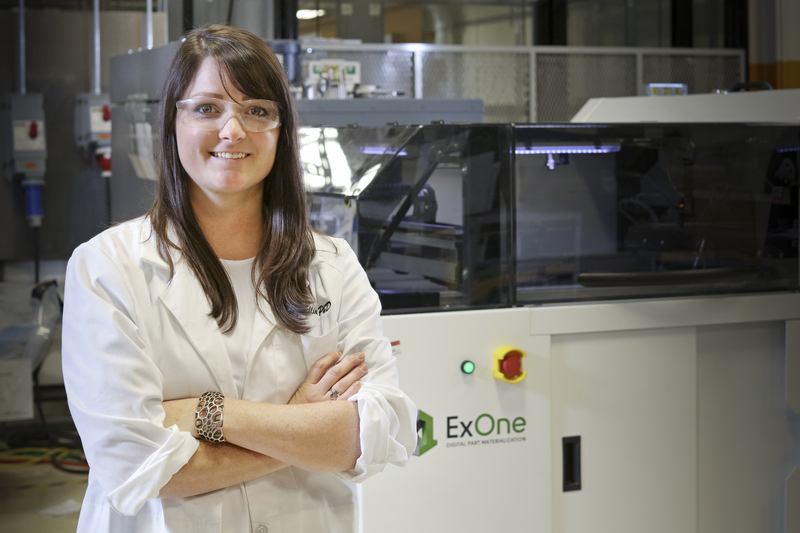 Researcher Amy Elliott and the ExOne binder jet printer at the Manufacturing Demonstration Facility. May 1, 2017—As an engineer and a science communicator, Amy Elliott wants to learn how stuff works, and she wants you to learn about it too. The researcher studies inkjet-based additive manufacturing at the Department of Energy's Oak Ridge National Laboratory—specifically how new materials can improve end products. Outside the lab, she works as a science expert on a cable show and has plans to launch a series of books and other products aimed at getting girls interested in science and engineering. Elliott got in on the ground floor of additive manufacturing while earning her PhD at Virginia Polytechnic Institute and State University (Virginia Tech), at a time when she says robotics was flourishing but 3D printing was just starting to attract attention. She had become interested in a career in science while participating in First Robotics in high school in Lincoln County, Tennessee, and later in the NASA Robotics Academy as an undergraduate at Tennessee Technological University. At Virginia Tech, when the opportunity to participate in an additive manufacturing program came along it fit well with her criteria for grad school: It was a well-scoped project with an outgoing professor. Elliott jumped at the chance to work with the school’s DREAMS Lab (Design, Research, and Education for Additive Manufacturing), and ended up studying inkjet binder printing—specifically the effects of quantum dots on polyjet direct 3D printing—for her thesis. Elliott started working at the Manufacturing Demonstration Facility (MDF) at ORNL in September 2013 as while completing her PhD in mechanical engineering. Today, Elliott’s work at the lab centers around experimental powder systems for binder jet additive manufacturing. Binder inkjet printing is a different process than the more popular 3D printing systems using laser and electron beams to melt materials and build up layers during printing. With the inkjet process, you essentially spread metal powder and glue it together with a binder. Then the object is subjected to even heat in a furnace. The result is less thermal distortion of the object being printed, and a faster overall process, Elliott noted. The process also allows the testing of a wider range of materials like ceramics, hybrid materials, and materials not easily fused in other additive processes. “We think there are materials out there that are successful in traditional manufacturing—perhaps they have been packed into a form for characterization—but we just haven’t tried them in 3D printing yet,” she said. This year, she will be testing the use of materials like titanium carbide infiltrated with aluminum, tungsten, and an ORNL-developed nickel aluminum material. The technology is well suited to creating porous metal parts, such as the bronze-backfilled bracelet she often wears, a gift from her husband. Elliott notes that a key target for 3D inkjet printing, as with all additive manufacturing, is in creating tools. Tooling, or the creation of molds and other parts used to manufacture end products, “is the killer application for additive right now, and I think will be in the future even when we understand material properties better,” Elliott said. “We’ve done a wide range of projects here, and it hits home for me that we can work hand in hand with industry at the MDF,” which is a DOE User Facility designed to encourage collaboration with industry. “We can help solve big problems for manufacturers and have an impact in that way too,” she said. She also has a concept for a cartoon character that she plans to use in books and other products to relate science to girls. The character’s name, Amelia Gearheart, is a take on Elliott’s proper name of Amelia. Elliott wears a ring in the shape of the associated logo—a gear with a heart in the middle. Elliott’s interest in science communication extends to her work with college students. Through the lab, Elliott is mentoring five interns, and she also works with colleges to help them develop curricula around additive manufacturing as part of the MDF’s STEM outreach program.